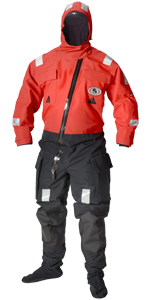 special model of the popular RDS Rapid Donning Suit especially made to meet the demands of the offshore industry. Collar structure is open, which eases dressing and enables ventilation in warm weather. Material: Gore-Tex® breathable fabric based upon the ePTFE membrane. Seam construction: double seams are heat seal taped and reinforced to be 100 % watertight. Reflective tape: The suit is equipped with reflective tape situated in propionate positions, which assures visibility in all conditions. The soft and durable reflective tape have been developed by 3M in accordance with the directive on marine equipment. Socks made of same fabric as the suit and enables use of any industrial footwear. Knee and back reinforcements made of hard wearing Cordura material. Hood: attached hood, which protects against wind and rain. Separate 3 mm neoprene hood, for protection against cold water. Gloves: integrated 3mm 5-finger neoprene gloves in sleeve pockets. Supplied in a carrying bag. Two chest pockets with zip and velcro tape. Left pocket is equipped with whistle, lace, buddy-line and small carabiner hook.